On a visit to Riquewihr in France’s Alsace region I spotted Picon Bière on the menu and wondered what it was. When I asked the barmaid she looked stunned that I’d never heard of it. She found it funny that I wasn’t familiar with a drink which – I’ve since learned – is a staple in this part of France. It’s beer mixed with a digestif, she explained, and she plucked the distinctive bottle of Amer Picon liqueur from the shelf and opened it to let me have a sniff. The unique aperitif had an orange-peel type smell. I was intrigued, but not being a huge fan of orange, decided to give it a miss. I gave in eventually though. I kept spotting Picon Bière on menu after menu and felt duty-bound to try it out. The boyfriend and I arrived in Metz and stayed in a hotel on the banks of the Moselle which sold Grimbergen at the bar. We had a Blond then an Ambrée then went exploring and discovered a good number of decent bars selling quality beers. 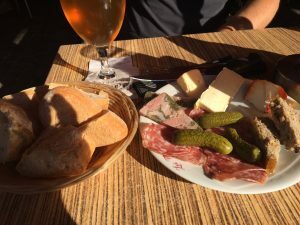 We went to a place called Les Trappistes near to Metz Cathedral, where we ordered a super tasty nibbling plate and finally got round to trying the Picon Bière. It had deep amber colour and distinct orangey aroma. It was a weird mix of potent but refreshing – you could tell it was stronger than your average beer but the bitter liqueur gave it a syrupy but zesty kick. Amer Picon – which dates back to 1830 – uses essences of gentian and quinine added to a base of distilled oranges, with caramel sugar and syrup. I saw a website describing Picon Bière as “the original French shandy”, but shandy it is certainly not. When I think of shandy I picture dilution with a non-alcoholic mixer, but there’s nothing diluted about this. On the contrary, the addition of this distinctive liqueur makes it instantly more potent. So ‘beer cocktail’ would probably be a more accurate description. If you can get your hands on a bottle of Amer Picon and want to try making it at home, the rule of thumb seems to be four parts beer to one part Picon. The ones we drank in Metz were made with a pilsner (which suits me as I’m not a massive fan of wheat beer) but apparently it also goes beautifully with Hoegaarden.